The United States of America have won their first Olympic gold medals since 1976 after a grueling and exciting last round. Despite clearly outrating opponents and neighbors Canada, they could only manage a 2.5-1.5 win. 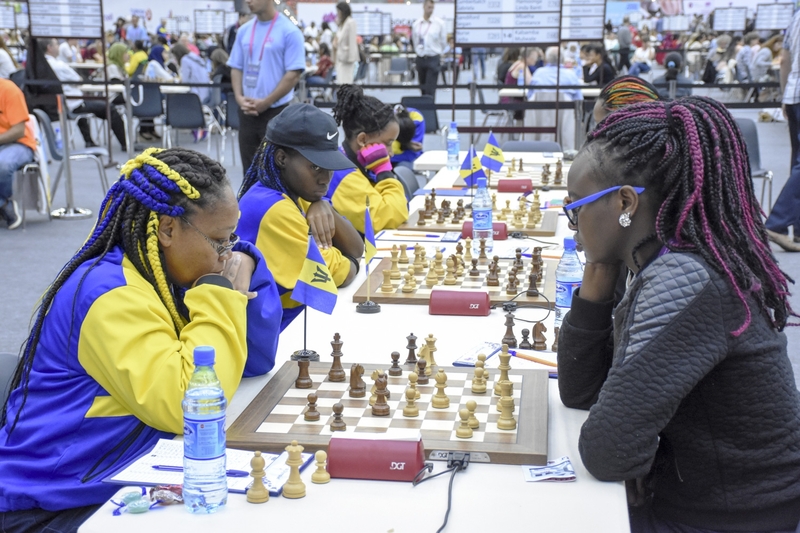 This gave rivals Ukraine a chance to overtake them on tie-breaks; they did put in a spirited performance, culminating in a 3.5-0.5 win against Slovenia, but it turned out not to be enough. Thus, the Open section of the Olympiad concluded in a tie for first place, with the American team celebrating victory by the narrowest of margins. The pre-tournament favorites Russia could only manage winning bronze, courtesy of a convincing win against Italy. The youthful team of India finished 4th, followed by record performances by Norway (5th), Turkey (6th) and Peru (10th), while Greece (18th) remained the only other undefeated team in the tournament (along with the USA). The Women’s section’s gold medals would be decided in the last-round clash between China and Russia. Despite a promising start for the Russians, the perseverance of the Chinese team helped them prevail in the end with a 2,5-1,5 victory; this defeat left their opponents out of the medals altogether. The Polish ladies won silver on tie-break over Ukraine. Thanks to their excellent performance in both sections, Ukraine won the combined Gaprindashvili Cup. In the special rating categories, rewarding lower-rated teams that overperformed, there were medals for India, Iran, the third team of Azerbaijan, Sudan and Chinese Taipei (Open section), as well as for Russia, Belarus, Malaysia, Syria and Indonesia. Finally, 28 international title norms were scored in the event. USA and Ukraine have continued the victorious ways to enter the final round tied on the first place with 18 points each. USA defeated Georgia 2,5-1,5 despite the loss of Nakamura to Mchedlishvili. Wesley So and Shankland secured the win for the team. Ukraine downed the solid Czech Republic 3-1. Eljanov emerged on 50% individual score by beating Navara, while Volokitin defeated Babula to accumulate incredible 7,5/8 points so far. India effectively ruined Russia's gold dream by holding them to a tie. 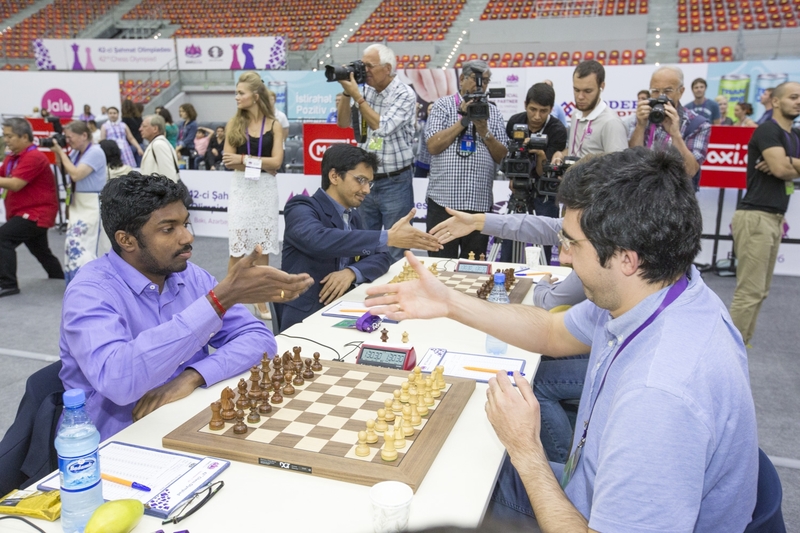 Harikrishna beat world championship challenger Karjakin, and Kramnik defeated Adhiban. England narrowly defeated Azerbaijan 2,5-1,5. Jones and Short won against Naiditsch and Safarli respectively, Mamedov won against Howell, and Adams drew Mamedyarov. Canada propelled itself to the top table by beating Latvia 3-1. Shirov won against Bareev, but on the lower boards Kovalyov, Lesiege and Hansen turned the score. Norway scored heavily against Iran 3,5-0,5, while Greece still remained undefeated after playing 2-2 with Spain. Azerbaijan 2 split the points with Serbia. Durarbayli won, Abasov and Guseinov drew, and Guliyev lost. Azerbaijan 3 crushed Japan 4-0, with the wins of Asadli, Bashirli, Gadimbayli and Gasimov. Top rounds 11 pairings are USA-Canada, Ukraine-Slovenia, Russia-Italy, Turkmenistan-Azerbaijan, India-Norway. In the Women section China is one step from reclaiming the gold medal, last won in Calvia 2004, after beating Poland 2,5-1,5 in the penultimate round. 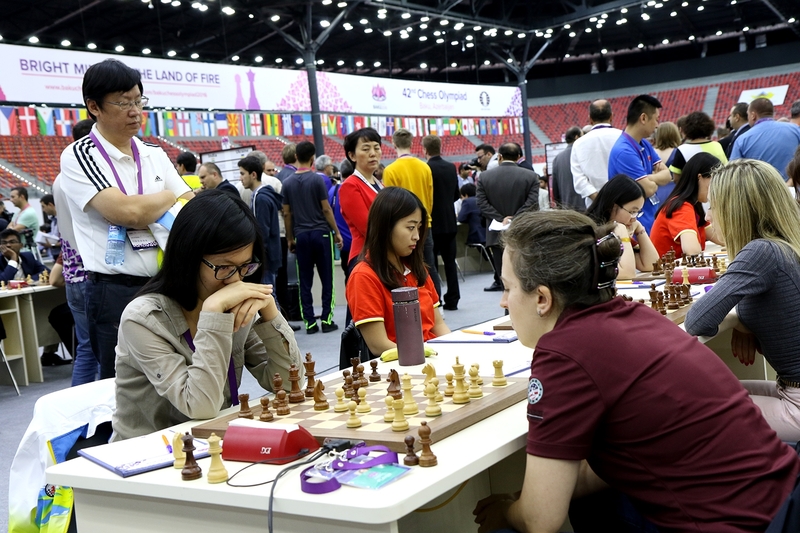 Zawadzka won for Poland, but that was not enough as Hou Yifan and Tan Zhongyi tipped the balance in China's favor. China is on 18 match points, two more than Russia, against whom they are paired in the last round. In the previous three Olympiads China was silver, each time behind Russia. India and Ukraine played a tie, with one win for each side, by Sachdev and Ushenina respectively. Russia defeated Georgia 2,5-1,5 thanks to the effort of Kosteniuk and Gunina on the top two boards. Batsiashvili scored the sole win for Georgia. Azerbaijan beat Colombia 3-1, with wins by Mammadzada, Mammadova and Kazimova, and a loss of Hojjatova. Mongolia held USA to a tie, while Hungary and Bulgaria narrowly defeated France and Germany respectively. Azerbaijan 2 walked past Switzerland 3,5-0,5, and Azerbaijan 3 narrowly lost to Belarus 1,5-2,5. Top round 11 pairings are China-Russia, Hungary-Poland, Ukraine-Bulgaria, Azerbaijan-Malaysia, USA-India. 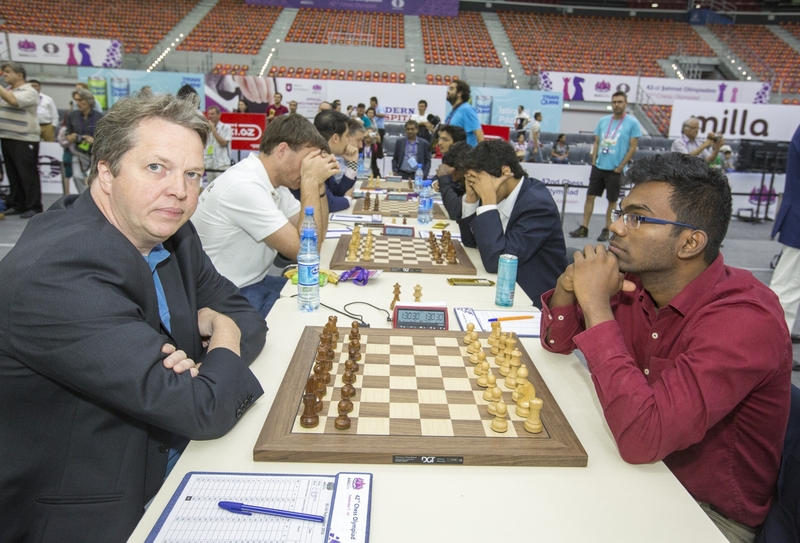 In round 9 of Baku Chess Olympiad the team of Ukraine found its way back to the top of the crosstable after narrowly defeating India. India's hero from the yesterday's round, Sethuraman, lost to Korobov in the only decisive game of the match. USA beat Norway 3-1 in a very attractive match. On the top board Caruana and world champion Carlsen made a draw. Nakamura and Shankland clinched the victory for USA. The young team of Iran held the experienced England to a tie. Lorparizangeneh beat McShane and Jones scored against Firouzja. Russia defeated Azerbaijan thanks to the wins of Kramnik and Grischuk, both with white pieces, against Radjabov and Naiditsch respectively. Mamedyarov-Karjakin and Mamedov-Tomashevsky were drawn. Latvia-Slovenia, Italy-Chile and Greece-Turkey all ended with even scores. Curiously, Greece is, along with USA, the only undefeated team in the Open section. Just like yesterday, Laznicka scored the only win in the match to secure Czech Republic win against Netherlands. Speaking of exceptional achievements, Jobava signed his third consecutive victory to contribute to Georgia's success against Hungary. With 7,0/8 points on the top board Jobava is performing over 3000 elo. Azerbaijan 2 lost to Vietnam 1,5-2,5. Durarbayli lost to his team-mate Le Quang Liem, while Abasov, Guseinov and Guliyev drew. Azerbaijan 3 beat Honduras 3-1. Bashirli and Gasimov won, while Asadli and Gadimbayli drew. USA and Ukraine are in the lead with 16 points each, followed by Russia on 15 points. Top round 10 pairings are Georgia-USA, Czech Republic-Ukraine, India-Russia, England-Azerbaijan, Latvia-Canada. In the Women section USA could not repeat the sensation from yesterday and lost narrowly to the top-seeded China. The only decisive game was a win by Ju Wenjun. Poland crushed Israel 3,5-0,5, with victories by Socko, Zawadzka and Wozniak. Russia recovered from the shock and defeated Vietnam 2,5-1,5, thanks to Gunina on the second board. 2nd seeded Ukraine scored heavily against Azerbaijan. 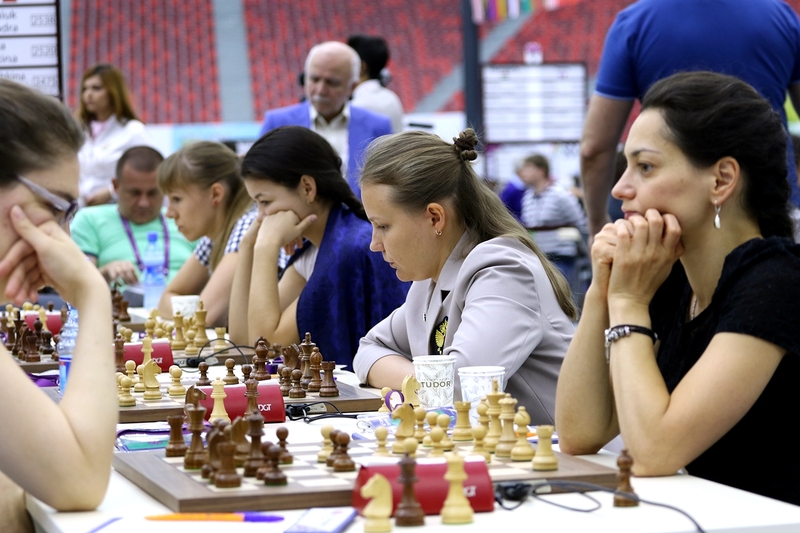 A.Muzychuk-Z.Mamedjarova 1-0, M.Muzychuk-Mammadzada 1-0, Gaponenko-Hojjatova 1-0, while G.Mammadova held Ushenina. India signed an important 3-1 victory against Netherlands. On the next table Hungary and Bulgaria signed four draws. Azerbaijan 2 lost 1-3 to France. Milliet won against T.Mamedjarova, as well as Navrotescu against Umudova. Khalafova and Fataliyeva made draws for their team. Azerbaijan 3 split the points with Algeria. Balajayeva won, N.Mammadova and Beydullayeva drew, while Katanova lost. China is on the top with 16 points, followed by Poland on 15 points. The big derby of the two top seeded teams, Russia and USA, concluded 2-2 after a long and tense struggle. Grischuk put Russia ahead with a win against Robson, but in the longest game of the match So defeated Nepomniachtchi to even up the score. Georgian leader Jobava is in excellent shape as proven by the swift victory against the former world champion Ponomariov. However, the rest of the Ukrainian players won their respective games for a rebound 3-1. India is back on the winning track after the match against England. Sethuraman scored the key victory against Short, while the remaining games were drawn. By the same narrow margin Azerbaijan defeated Latvia, thanks to Safarli's decisive win in the longest game of the match. This is Safarli's third straight victory. 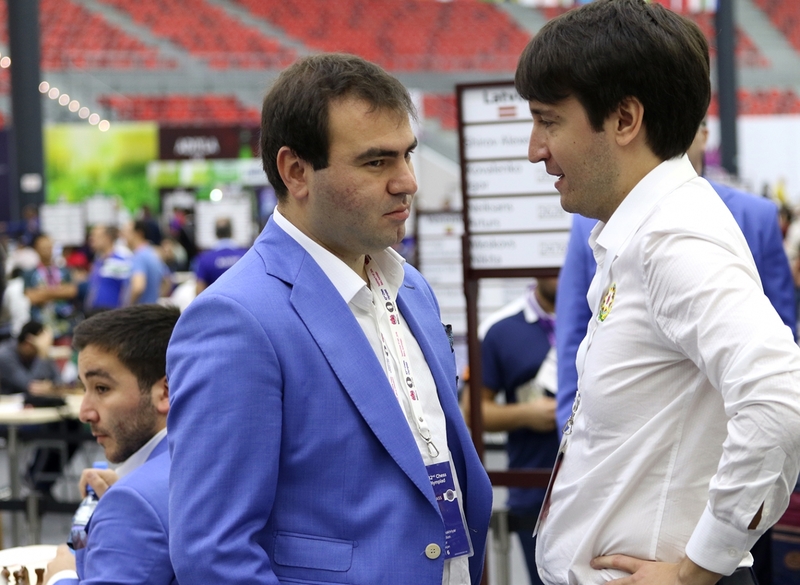 Mamedyarov, Radjabov and Mamedov drew their respective games. Italy and Iran tied the match with four draws. Greece and Slovenia made the same score, but with four decisive games - wins by Papaioannou, Halkias (Greece) and Lenic, Borisek (Slovenia). 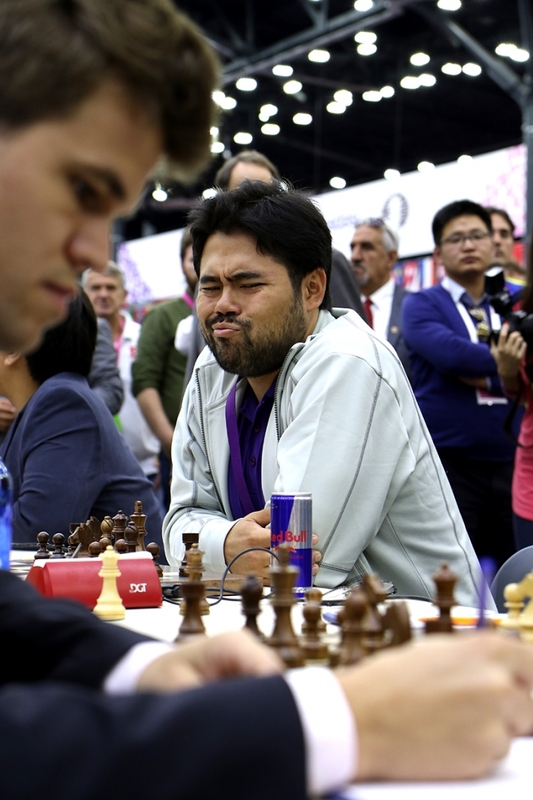 Norway beat Peru 3-1, with a win of world champion Magnus Carlsen on the top board, while defending champion China sunk deeper after another loss - this time against Hungary (sole win by Almasi). Azerbaijan 2 is with a sound 3-1 victory against Finland. Guseinov and Guliyev won, while Durarbayli and Abasov drew. Azerbaijan 3 defeated Dominican Republic 2½:1½. Gadimbayli and Gasimov won, Asadli drew and Muradli lost. After 8 rounds of play USA, India and Ukraine are leading with 14 points each, followed by Russia, Azerbaijan and Norway on 13. Top round 9 pairings are Ukraine-India, USA-Norway, Iran-England, Azerbaijan-Russia, Latvia-Slovenia. In the Women section another match Russia-USA on the top table. The girls from USA shocked the defending champion and took home a narrow 2,5-1,5 win. Gunina won for Russia, Nemcova for USA, and the overall score was to be settled on the first board. 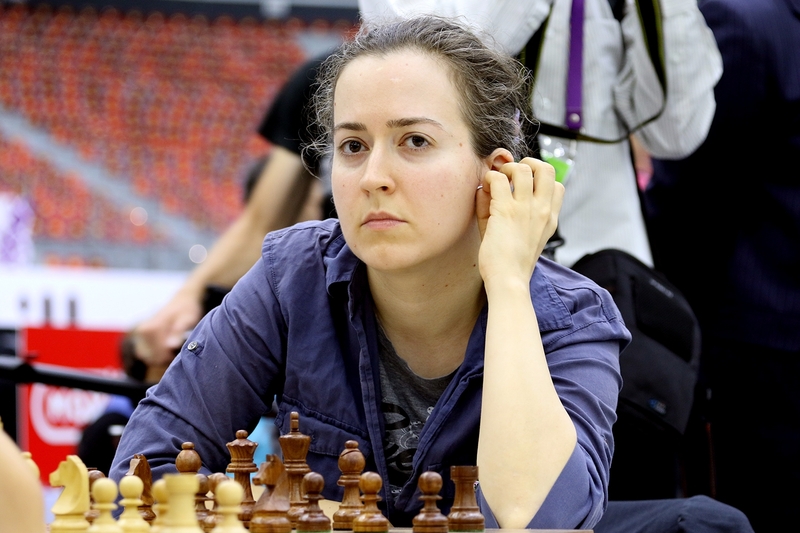 In the longest game of the match Irina Krush defeated former world champion Alexandra Kosteniuk to mark the start of big celebration. Despite the loss of team leader Monika Socko, Poland was able to seize the victory against Netherlands thanks to Kulon and Wozniak on the lower boards. Hungary held the favored Ukraine thanks to a win of Lazarne Vajda against the former world champion Mariya Muzychuk. Gaponenko's win kept the score level. Top seeded China returned to the joint lead with a 3,5-0,5 win against Azerbaijan. Hou Yifan-Z.Mamedjarova 1-0, Ju Wenjun-Mammadzada 1-0, Tan Zhongyi-Kazimova 1-0 and Zhao Xue-Mammadova draw. The 52nd seed Turkmenistan narrowly lost to Israel, while Vietnam defeated Romania 3-1. Azerbaijan 2 defeated Singapore 3-1. Khalafova, Fataliyeva and Umudova won, while Abdulla lost. Azerbaijan 3 split the points with Peru. Allahverdiyeva won, Balajayeva and Beydullayeva drew, while Mammadova lost. After 8 rounds of play China and USA are joint leaders with 14 points each, followed by Poland and Israel on 13. Top round 9 pairings are USA-China, Israel-Poland, Vietnam-Russia, Ukraine-Azerbaijan, India-Netherlands. The 7th round of the Baku Chess Olympiad will be remembered for many decisive matches won by large margins. USA stopped India's triumphal run with a huge 3,5-0,5 victory. Harikrishna drew Caruana, but further Nakamura, So and Shankland won for the States. On the second table Latvia stunned the higher-rated Netherlands with victories on black boards by Kovalenko and Meskovs. Shirov and Neiksans drew their respective games. Russia demolished the solid Czech Republic 3,5-0,5. World championship challenger Karjakin defeated Czech's best player Navara. Tomashevsky and Nepomniachtchi also won, while Babula was able to hold Grischuk to a draw. In similar fashion Azerbaijan crushed Croatia. Saric's draw against Mamedyarov was all that Croatia could make, as Radjabov, Mamedov and Safarli won for a big celebration of the host country. Georgia's top scorers Jobava and Pantsulaia struck again to seal the team's 3-1 victory against Romania. The defending champion China slipped further down in the rankings after losing 1-3 to England. The advancing Canada provided strong resistance against the higher rated Ukraine. New top board Bareev defeated Eljanov with black pieces, but the wins of Korobov and Volokitin turned the score into Ukraine's favor. World champion Magnus Carlsen secured Norway's minimal win against Turkey by defeating their top board Dragan Solak. Azerbaijan 2 tied the match against Venezuela. Guseinov won, Bajarani lost, while Durarbayli and Guliyev drew. Azerbaijan 3 narrowly lost to ICCD. Asadli scored his third consecutive win on the top board, Gadimbayli drew, while Bashirli and Gasimov lost. Top round 8 pairings are Russia-USA, Georgia-Ukraine, England-India, Azerbaijan-Latvia, Italy-Iran. In the Women section Poland held Russia to a tie thanks to the victory of Szczepkowska-Horowska. Gunina scored for Russia and the remaining two games were drawn. In the clash of the two top seeded teams China narrowly defeated Ukraine by 2,5-1,5. Tan Zhongyi won against Zhukova, while the three games were drawn. USA joined the leading pack thanks to the national champion Nazi Paikidze winning against her counterpart from Romania. Azerbaijan shocked the higher rated 5th seed India and clinched a 2,5-1,5 victory thanks to the efforts of Mammadzada and Mammadova. Mamedjarova held Dronavalli to a draw, while Hojjatova lost. Netherlands had a similar heroic act by beating the 4th seed Georgia. Tea Lanchava made all the difference by defeating Bela Khotenashvili. Germany and Uzbekistan tied their match with four decisive games, while 52nd seed Turkmenistan surprised Greece and won by 3-1. Azerbaijan 2 crushed Belarus 3,5-0,5. Khalafova, Fataliyeva and Umudova have won, while T.Mamedjarova drew. Azerbaijan 3 narrowly beat Bolivia 2,5-1,5. N.Mammadova won, Balajayeva, Beydullayeva and Allahverdiyeva drew. Top round 8 pairings are Russia-USA, Poland-Netherlands, Hungary-Ukraine, China-Azerbaijan, Turkmenistan-Israel. After six rounds of play at the 42nd Chess Olympiad the team of India has singled out on the top with perfect score by defeating Netherlands. The sole winner was B Adhiban and the remaining games were drawn. Fabiano Caruana secured the victory for USA in the clash against Ukraine. Czech Republic and Georgia split the points by signing draws on all four boards. Azerbaijan and Greece also split the points, but there were decisive games. Mamedyarov and Radjabov drew on the top two boards, Athanasios Mastrovasilis defeated Arkadij Naiditsch, and Eltaj Safarli equalised against Stelios Halkias. The team of Canada is doing quite well as they beat Belarus 2,5-1,5 thanks to the win of Eric Hansen. By the same score China defeated Argentina but it should be pointed that Sandro Mareco beat Wang Yue on the top board. Russia made a comeback with a 3-1 win against Germany, the full points being delivered by Kramnik and Nepomniachtchi playing white. Philippines held Norway 2-2 with GM Sadorra making a draw with world champion Magnus Carlsen. Azerbaijan 2 lost to Romania 1,5-2,5. 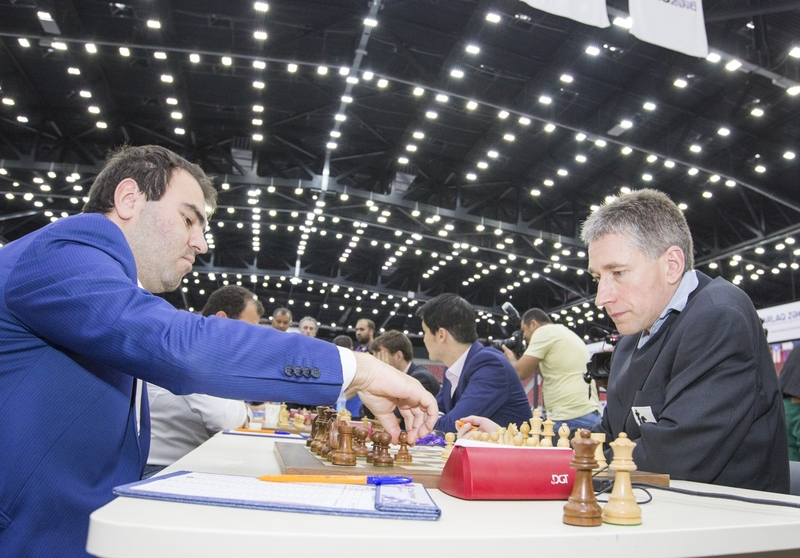 Namig Guliyev won on the fourth board, but Vasif Durarbayli and Nijat Abasov were defeated. Azerbaijan 3 smashed Ghana 4-0 with wins by Asadli, Gadimbayli, Abdulla, Muradli and Gasimov. Top round 7 matches are India-USA, Latvia-Netherlands, Russia-Czech Republic, Croatia-Azerbaijan, Georgia-Romania. In the Women section all top matches were tightly contested and finally ended in ties. Ukraine had better positions in the match against Russia, but by the end of the day only Anna Muzychuk won against Kosteniuk and Girya equalised against Ushenina. World champion Hou Yifan skipped the match, and Romania was able to hold China. Corina-Isabela Peptan beat Ju Wenjun, while Guo Qi scored against Irina Bulmaga. Azerbaijan held their neighbors and 4th seed Georgia to a tie. Dzagnidze defeated Mamedjarova and Mammadova beat Batsiashvili. Mammadzada and Kazimova drew their respective games. Kazakhstan and Hungary drew four games, while Poland and Vietnam produced four decisive results with the overall result tipping in favor of Poland 3-1. India surged ahead with a win against Latvia as Harika Dronavalli signed her first full point in the tournament. Azerbaijan 2 and Czech Republic had an even match 2-2. Fataliyeva won, Abdulla lost, while T.Mamedjarova and Khalafova drew. Azerbaijan 3 beat Chile 3-1 thanks to wins of N.Mammadova and Balajayeva. Top round 7 pairings are Russia-Poland, China-Ukraine, USA-Romania, Azerbaijan-India, Netherlands-Georgia. 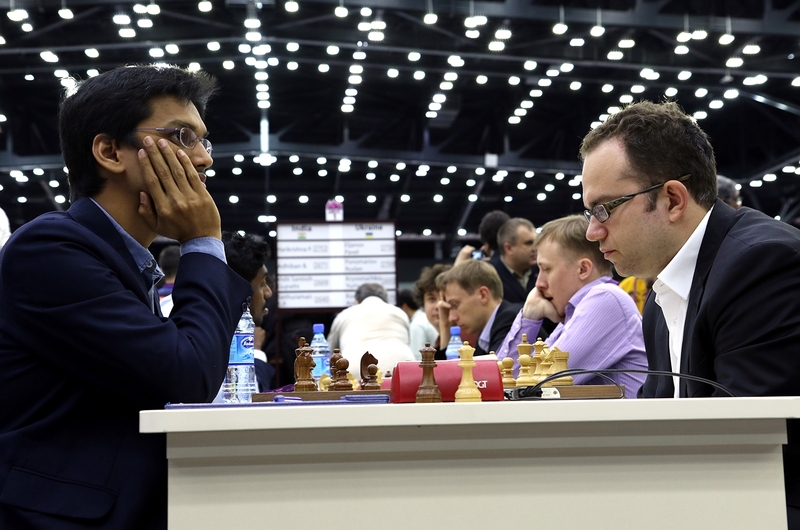 India ended Azerbaijan's winning streak as Mamedyarov and Naiditsch recorded first loses after 4 consecutive wins. On the other side of the table, Vidit Gujrathi won 5th game in a row. The overall score is 3-1 in favour of India. Azerbaijan 2 crushed Turkmenistan 4-0, with wins of Durarbayli, Abasov, Guseinov and Guliyev. Azerbaijan 3 lost to Zimbabwe with a consoling win of Vugar Asadli on the top board. Azerbaijan pulled up a huge 3-1 victory against the higher rated Germany. 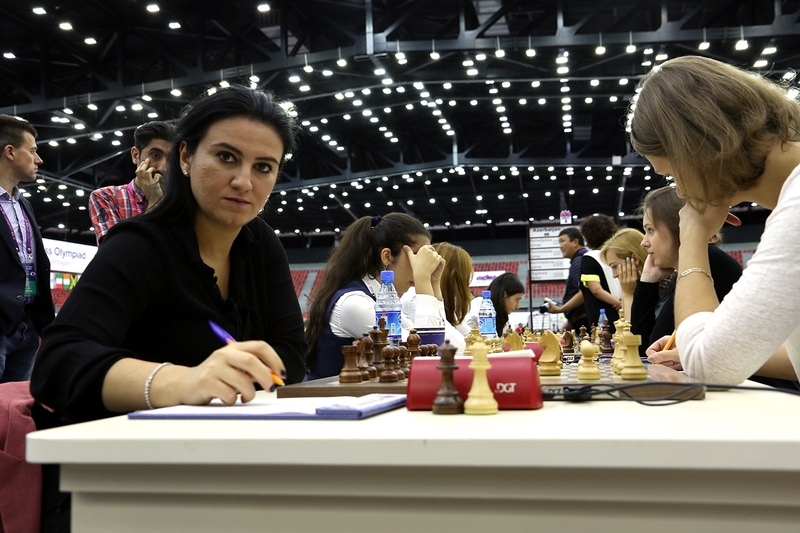 The win was clinched on the lower boards by WGM Mammadova and WFM Hojjatova. WGM Mamedjarova and WGM Mammadzada drew their games. Azerbaijan 2 tied Spain: Turkan Mamedjarova lost to higher rated Sabrina Vega, and Ulviyya Fataliyeva held the balance on the 3rd board. Azerbaijan 3 lost 1-3 to Turkmenistan. 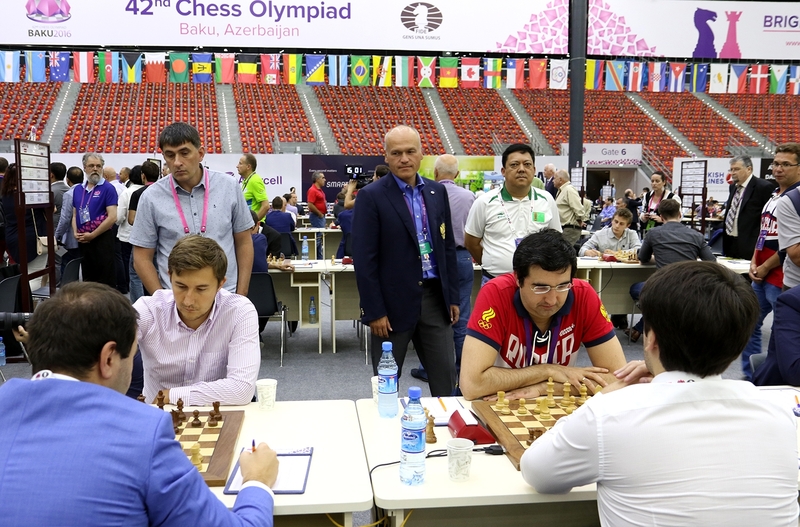 Round 4 of the World Chess Olympiad brought a big derby between the top rated Russia and 5th-seeded Ukraine. Ian Nepomniachtchi put Russia in the lead, but the Ukrainians fought back and with the wins by Ponomariov and Volokitin turned the match in their favour 2,5-1,5. The 2nd-seeded USA were held to a tie by the solid Czech Republic, but the other favourites fared better. Azerbaijan and China won by 3-1 against Romania and Italy, respectively. India defeated Cuba 2,5-1,5 and Netherlands demolished England 3,5-0,5. Sergei Zhigalko defeated Alexei Shirov to secure a narrow Belarus victory against Latvia. In similar fashion, Tsegmed Batchuluun brought the victory for Mongolia against the higher-rated Croatia. Aleksandar Indjic put Serbia in lead against Slovenia, but Luka Lenic struck back to even the match. 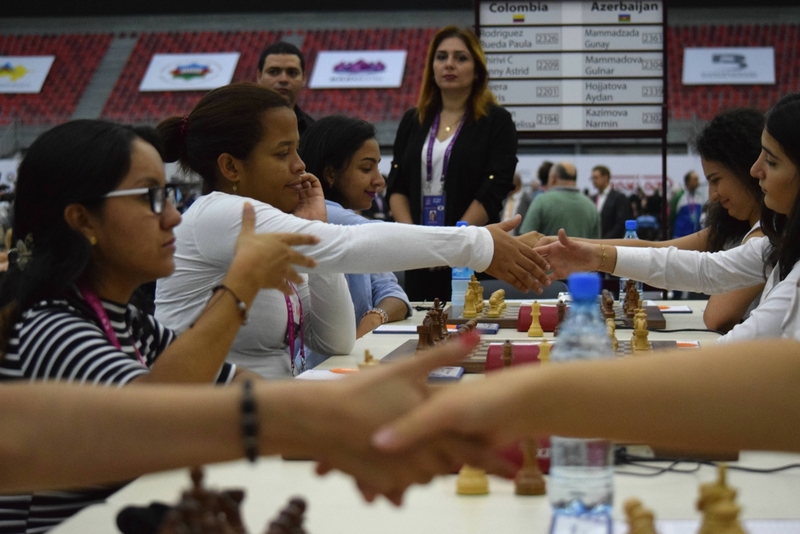 Spain crushed Peru by 3,5-0,5 and Georgia defeated Bulgaria 3-1 with a Jobava win against Topalov on the top board. Azerbaijan 2 was convincing against IBCA 3,5-0,5, while Azerbaijan 3 lost by the same result to Turkmenistan. Top round 5 matches are Ukraine-China, Netherlands-Belarus, Serbia-USA, Azerbaijan-India, Slovenia-Czech Republic. 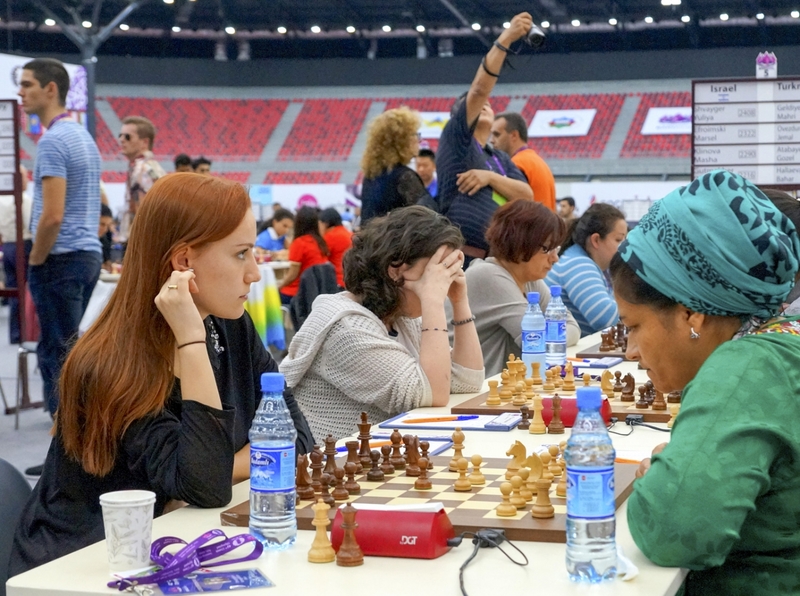 In the Women section the biggest attention was attached to the victory of Dana Reizniece-Ozola, Latvia's top board and also the country's Minister for Finance, against the world champion Hou Yifan. China still emerged on the top with wins of Ju Wenjun and Guo Qi. On the first table Russia defeated Hungary thanks to Natalija Pogonina's effort on the 4th board. Ukraine was convincing 3,5-0,5 against France, whose top rated player Sophie Milliet took a day off. India and Israel, as well as Azerbaijan and Romania, exchanged blows but by the end of the day their respective matches were tied. Kazakhstan came up top in the clash with Lithuania. Pia Cramling won a nice game to bring Sweden in the lead, but Serbia dominated on the remaining boards for a total 3-1 victory. Italy narrowly defeated Azerbaijan 2, while Azerbaijan 3 split the match points with Brazil. Top round 5 matches are Serbia-Ukraine, Russia-Kazakhstan, Israel-Romania, Azerbaijan-Germany, Vietnam-India. Round 3 of every World Chess Olympiad is usually the point when the higher rated teams start being paired against each other. Many matches were closely contested and the final scores were hanging on a balance. Russia defeated Moldova 3-1 thanks to the victories on the lower boards. Azerbaijan beat Hungary by the same score, but all four games were decisive - Mamedyarov, Mamedov and Naiditsch won for the hosting country, while Almasi was sole winner for Hungary. The solid team of Cuba won against the higher-rated Poland thanks to the wins of Quesada Perez and Ortiz Suarez. The emerging star Duda scored for the opposite side. Adhiban and Vidit secured the Indian victory against Azerbaijan 2, while Anish Giri brought the points for Netherlands against Vietnam. Italy shocked the higher-rated Turkey thanks to the young hope Luca Moroni Jr. By the same narrow margin Ukraine defeated Germany, the executioner being Andrei Volokitin. Heavy favourites USA and China won against the south American teams Argentina and Brazil, respectively, by the identical 3-1 score. Azerbaijan 3 smashed Lebanon by 4-0. Round 4 top matches are Ukraine-Russia, India-Cuba, USA-Czech Republic, Romania-Azerbaijan, China-Italy. 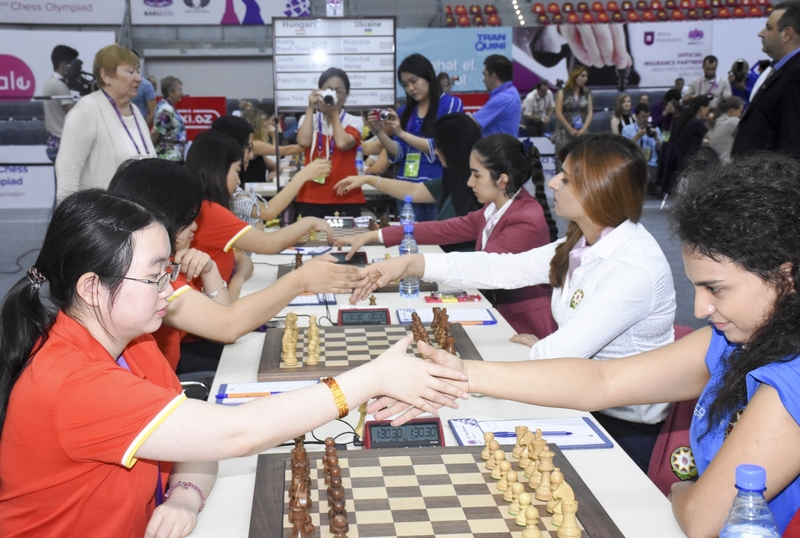 In the Women section the world champion Hou Yifan made a debut in this Olympiad and won her game, but this was not sufficient for the top seeded China to beat Vietnam. Thi Mai Hung Nguyen leveled the score by defeating Zhao Xue. Russia walked past Uzbekistan 3-1 thanks to wins of Kosteniuk and Gunina, and Lithuania maintained perfect score by narrowly defeating Cuba. Azerbaijan stunned the higher-rated Poland with the wins of Mamedjarova and Mammadzada. The lone success of Klaudia Kulon was not sufficient to even the score. Italy and Argentina exchanged the blows to tie the match, while France crushed Venezuela 3,5-0,5. Former world champion Anna Ushenina secured Ukrainian victory against USA. Azerbaijan 2 held the favoured Germany to a tie 2-2, and Azerbaijan 3 crushed Kyrgyzstan 4-0. Top round 4 matches are Hungary-Russia, Ukraine-France, India-Israel, Azerbaijan 1-Romania, Lithuania-Kazakhstan. In the second round of the Baku Chess Olympiad the top rated teams continued scoring high victories. Russia, Azerbaijan, Poland and India were crushing against Turkmenistan, FYROM, UAE and Costa Rica respectively. USA dropped half a point to Scotland, as McNab held Shankland, and Belgian hope Nicola Capone drew the Chinese superstar Wei Yi. Indonesia snatched 1,5 points against England, while Zambia took the same number of points from Moldova and Faroe Islands made two draws against the favoured Bulgaria. Iran and Georgia, Slovakia and Greece, Mongolia and Finland tied their matches. World champion Magnus Carlsen entered the competition helping his Norway to score a narrow victory against Bangladesh. Azerbaijan 2 crushed the solid team of Lithuania 3,5-0,5, but Azerbaijan 3 lost by the same score to the experienced Belarus. In the Women section China and Russia were convincing against Montenegro and Ecuador respectively. Philippines stunned Georgia, one of the main contenders for the gold medal. WIMs Fronda and Secopito were victorious and WIM Frayna held a draw on the top board. India defeated Brazil 3-1, but WIM Terao shocked the Grand Prix winner Harika Dronavalli. USA signed a narrow 2,5-1,5 win against Norway, the same result that Azerbaijan achieved against Mexico. Same score yet again as Azerbaijan 2 beat the higher rated Mongolia. Azerbaijan 3 narrowly lost to Turkey 1,5-2,5. The long anticipated 42nd World Chess Olympiad began today at the beautiful Baku Chrystal Hall with the games of the first round. A record breaking 180 teams compete in the Open Section, while the Women Section has 140 teams participating. 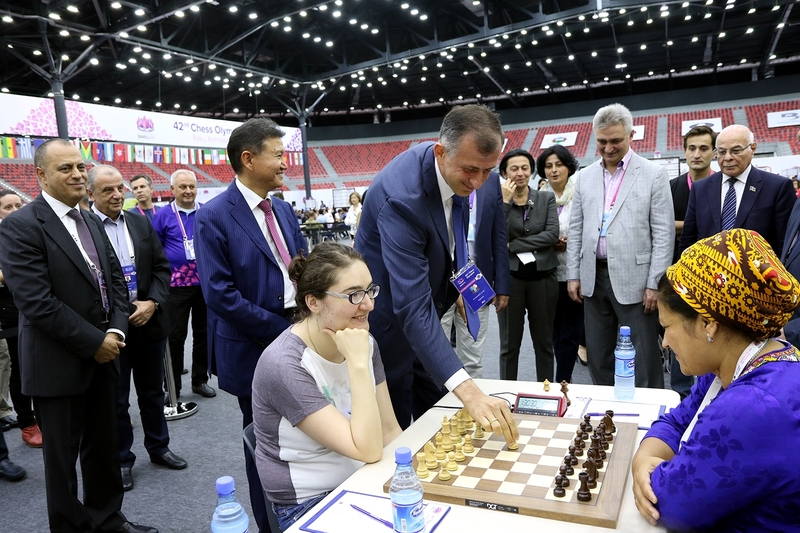 President of the Republic of Azerbaijan Ilham Aliyev opened the first round of Chess Olympiad by making the honorary move 1.d4 in the game Shakhriyar Mamedyarov - Rodwell Makoto of the match Azerbaijan-Zimbabwe. Joining the President of the Republic of Azerbaijan were FIDE President Kirsan Ilyumzhinov and other officials. During the live broadcast, President Aliyev said: "I am very glad that everybody is happy, that everybody is satisfied. Yesterday we had an excellent opening ceremony. Today the competition starts. The whole world is in Baku. And it is a record number of countries participating at the Olympiad. I am glad that all the organizing issues have been resolved and I hope that during these two weeks all our new guests will also find time to see around, to know the country and to come back as tourists." As usual in the events run by Swiss pairing system, the top seeded teams faced the lower rated opposition. Most of the world's best players participating in the Olympiad sat out of the first round. However, Azerbaijan started with the top lineup to convincingly defeat Zimbabwe 4-0. Russia won by the same result against Nigeria, as well as USA against Andorra. The biggest upset of the round was produced by Sudan, who held the heavy favorites Bulgaria to a 2-2 tie. FM Tagelsir scored a wonderful victory against GM Nikolov and A.M.Abdalla defeated IM Petrov. Norway conceded two draws to Wales, with world champion Magnus Carlsen opting out of the first round. Trinidad & Tobago snatched one point from Serbia. 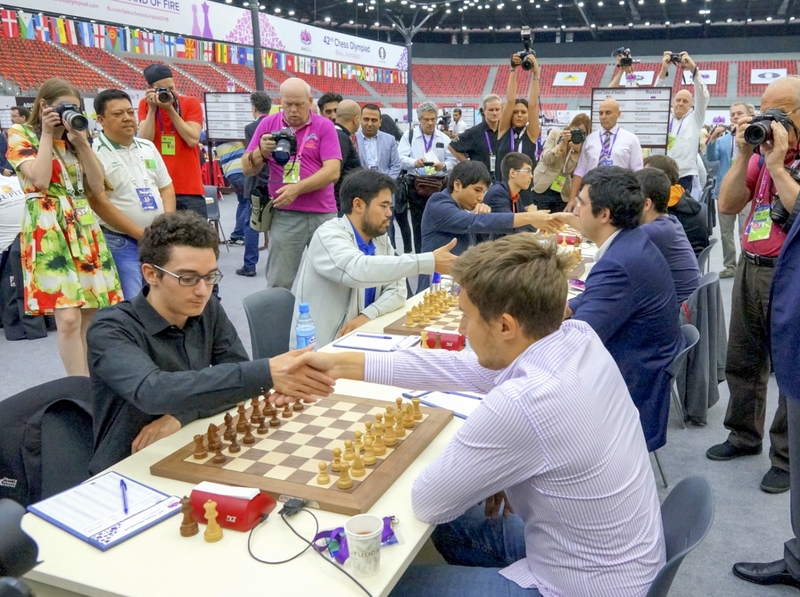 Azerbaijan 2 scored 3½-½ against Mozambique, where FM Alice held GM Durarbayli to a draw. Azerbaijan 3 made a clean 4-0 win against Papua New Guinea. In the Women Section the top seeded teams scored convincing victories. China, Ukraine, Russia, Georgia and India all signed 4-0 against Luxembourg, Portugal, Scotland and ICCD respectively. Greece dropped 1,5 points against Sri Lanka narrowly winning the match. Azerbaijan 1 and 2 were convincing 4-0 against Nicaragua and Japan respectively, while the opponents of Azerbaijan 3, Lesotho, did not appear on time for the first round. Lesotho is expected to arrive to Baku soon. The 42nd Chess Olympiad was opened with a solemn but highly entertaining ceremony, held at the Baku National Gymnastics Arena, attended by the President of the Republic of Azerbaijan Ilham Aliyev, his wife Mehriban Aliyeva, family members, the President of the World Chess Federation (FIDE) Kirsan Ilyumzhinov and other delegates, world chess champions as well as various state and government officials. Players, captains and delegates of the 176 participating federations filled the National Gymnastics Arena to enjoy a wonderful evening. After the anthems of the Republic of Azerbaijan and FIDE, a video on the development of sports, including chess, in Azerbaijan was screened. The Chairman of the Organizing Committee of the Baku Chess Olympiad, Azerbaijan’s first Deputy Prime Minister Yaqub Eyyubov addressed the public, commenting on the great contribution of the President and his father to the sporting successes of the host country, before pointing out the great effort that has gone into the preparations for the Olympiad. Finally, he stated his confidence that everything is ready for a well-organized and enjoyable Olympiad and promised this to be one of the most memorable in chess history. FIDE President Kirsan Ilyumzhinov took the stage next, welcoming all participants of this record-breaking Olympiad, which boasts 181 teams in the Open section and 142 in the Women’s. The President extolled the great preparatory work carried out by the Organizing Committee and expressed his belief in the success of the Baku Olympiad, based on the vast experience of Azerbaijan in hosting important chess events as well as its remarkable infrastructure and beauty, before closing with the FIDE motto “Gens Una Sumus” (we are one family). The President of the Republic of Azerbaijan, Ilham Aliyev, then declared the 42nd Chess Olympiad open. The artistic part of the opening ceremony featured some remarkable visuals, paired with several dancing sequences that captivated the audience. After a short piece showcasing the influence of the sea in Azerbaijani tradition, the main focus of the ceremony was the connection between people and chessmen, with a beautiful waltz choreography being the centerpiece of the show. This was followed by a stunning graphical show, featuring traditional carpet patterns and designs, embracing a dance group replaying a game of Chaturanga (an ancient form of chess). Next was the traditional parade of flags of all the participating nations; this was carried out both by visuals and by dancers holding nagaras (a traditional Azerbaijani percussion instrument) painted with the colors of each flag; they left the stage under the sound of an adaptation of “We Are The World”. Former World Champion Vladimir Kramnik and Women’s World Champion Hou Yifan joined the Chief Arbiter Faik Gasanov on stage for the drawing of colors, as leaders of the highest-rated teams in the two sections; Kramnik was less fortunate than his colleague, drawing the black pieces for his team in the first round (Hou drew white). This ceremonial administrative task concluded the main part of the ceremony, which was closed by a song specially composed for the Olympiad and performed by popular Azerbaijani singers. 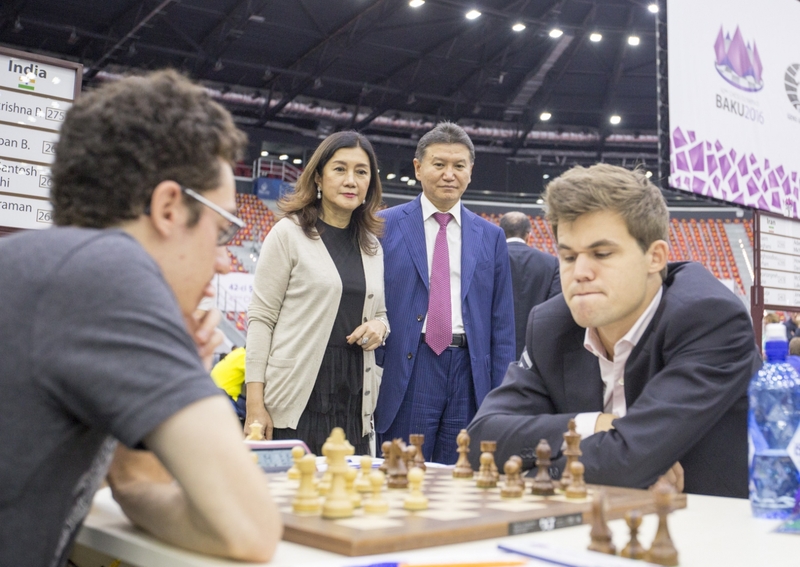 Then it was time for everyone to go home – except the team captains, who stayed for the Captain’s Meeting and other formalities before the beginning of the chess part of the Olympiad. 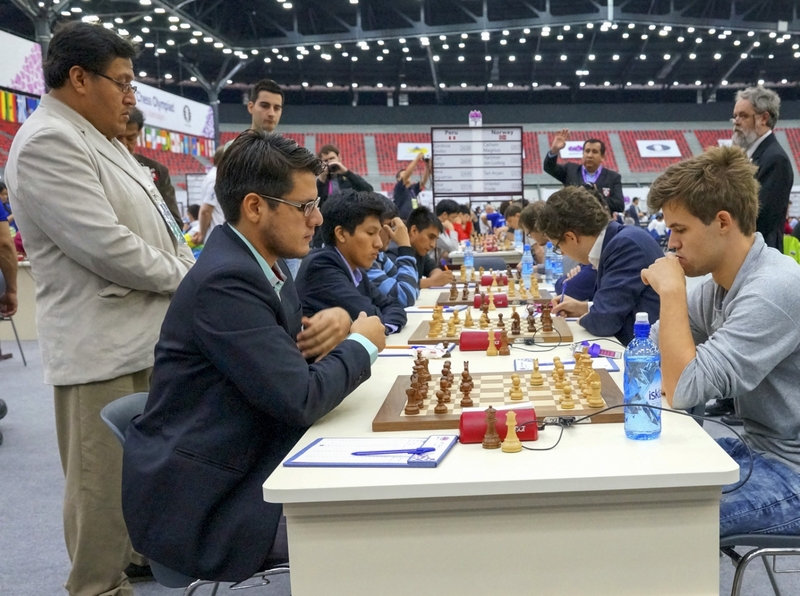 The Chess Olympiad is a major event in the world of sports, generally attracting more than 150 countries and around 3,000 athletes and officials. FIDE organized the first official Olympiad in 1927 in London (the actual name “Olympiad” was introduced later, in 1952). The Olympiads were held occasionally and at irregular intervals until World War II. There was a long break from 1939 until 1950, but since 1950 they have been held regularly every two years. In total, 41 Olympiads have been organized since 1927. The 42nd Olympiad in Baku will go down in history, in view of its record-breaking participation of teams representing 176 countries – a total of 181 men`s and 142 women’s teams will compete in this great sporting event. The host country, Azerbaijan, will be represented by three teams in each section. In the Open section, Russia is the top seed of the Olympiad, with an average rating of 2760. USA (2740) and China (2735) are second and third respectively, while host team Azerbaijan is fourth seed with an average rating of 2705. 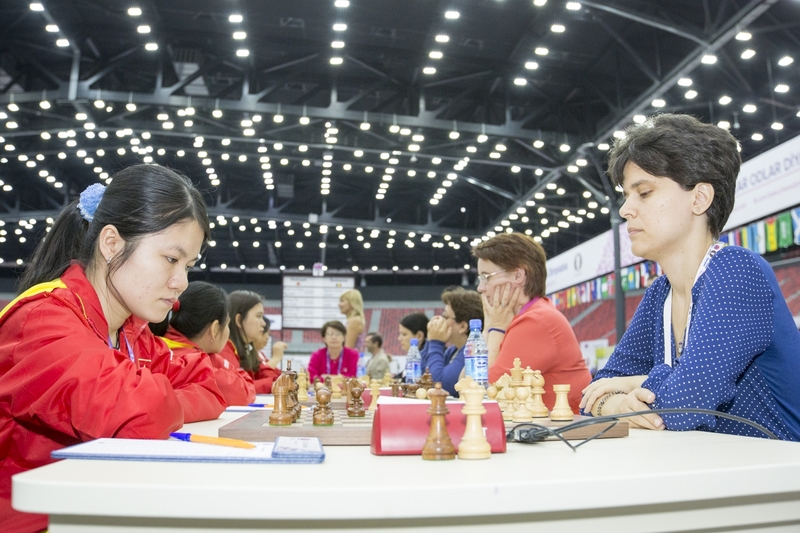 China is the top seed in the Women`s event with an average rating of 2528. Russia (2493) and Ukraine (2485) are second and third seeds respectively, while Azerbaijan (2320) is seeded fourth here as well. The Organizing Committee of the Baku Olympiad was set up by an order of President Ilham Aliyev on February 14th, 2013, with the aim of ensuring the best possible organization of the Chess Olympiad. The Organizing Committee has done a great job to fulfill this task: ideal conditions were created at the Baku Crystal Hall, where the games of the Olympiad will take place. Visa regulations for athletes and delegates visiting Azerbaijan were simplified under the President`s order, while all possible measures were taken to ensure the safety of the athletes. Thirty Azerbaijani arbiters will officiate at the Olympiad, headed by Chief Arbiter Faik Gasanov. Over 500 volunteers are engaged in all aspects of the Olympiad, both during the preparatory phase and the event itself. More than 250 local and foreign media representatives will be covering the Chess Olympiad, for a great variety of media, printed and electronic. In parallel with the Olympiad, Baku will also host the annual FIDE Congress, with participation of delegates from 183 countries. The first round of the Olympiad commences at 15.00 on September 2nd. The 11-round event concludes on September 13th.